Paris Vegas Casino, an online casino created by Interactive Marketing Solutions N.V, the virtual casino operator licensed in Curaçao, made its first appearance in 2010. This online casino immerses players in the exhilarating world of Las Vegas and the equally exciting city of Paris thanks to its very wide range of all kinds of casino games. 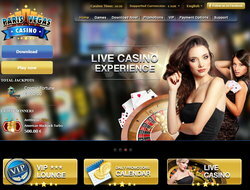 Paris Vegas Casino also offers a live section with live dealers. Paris Vegas Casino’s gaming platform developed by Next Gen Gaming is available to download. Players can access the Australian developer’s complete range of about 150 games which includes all the major table games and classic casino card games: blackjack (progressive, European and American), baccarat, roulette (French, American, European), craps, Casino War, Caribbean Poker, Pai Gow, video poker etc. There is also a great variety of slot machine games including several classic slots and also the famous 3D video slot machines which have made Next Gen Gaming famous : Merlin’s Million, Medusa, Hot Hot Volcano, Snake Charmer, Hot Wheels, Ghost Pirates and Vampires Feast. Progressive jackpots are also available. The range of games from Paris Vegas Casino also includes a Live Casino section offering the possibility to play live with live dealers. This part of the casino with blackjack, roulette and baccarat tables has been developed by XproGaming, an Interactive Marketing Solutions N.V partner company. Paris Vegas Casino’s Live section powered by Evolution Gaming, which has made its mark on the platforms of other online casinos operated by Interactive Marketing Solutions, offers players complete immersion in the atmosphere of Las Vegas by streaming games from a casino studio. In a very realistic atmosphere one can be at ease just like in a land based casino and bet at baccarat, online roulette or blackjack tables in the company of warm and seductive female dealers. All levels of players can benefit from a very attractive welcome bonus on their first three deposits. These bonuses of 200% with a limit of €1000 on each deposit, let one cash in up to €3000 in bonuses which can be used on all the slot machines and casino games. The wagering condition is 30x the bonus plus the deposit. This is quite reasonable even though we tend to advise players to refuse bonuses so they can withdraw their winnings without conditions. Paris Vegas Casino also has several weekly and monthly promotions as well as a VIP programme with many other bonuses and good cash back. Just like the casino’s platform, Paris Vegas Casino’s customer service is multi-lingual. Available 24/7 by telephone, fax, email or live chat help is offered in over twenty languages. The wait time is short and the answers provided are quite precise. Paris Vegas Casino is available to English players and to players from all over the world except for those from Turkey, Israel, USA and Cyprus. We greatly appreciate the casino’s intuitive interface, its good variety of games as well as its exceptional €3000 welcome bonus. There are numerous roulette, baccarat and blackjack tables so there is always space for players. The female dealers are pleasant and professional and images are transmitted live.